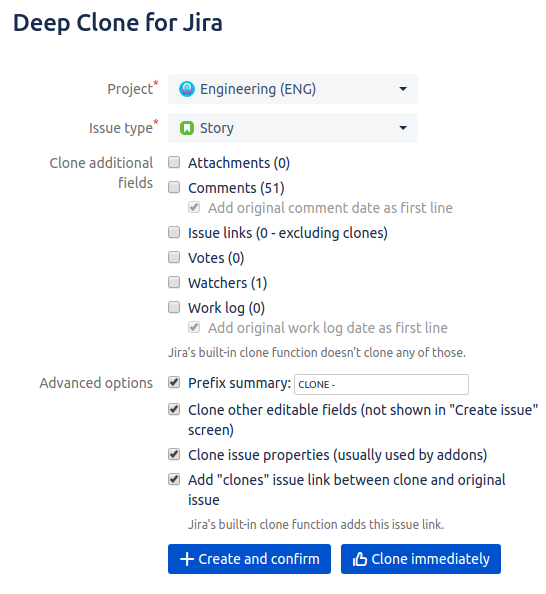 This is the documentation for the Atlassian Jira app Deep Clone for Jira. In the menu on the left side, navigate to “Find new apps” under the “apps” category. 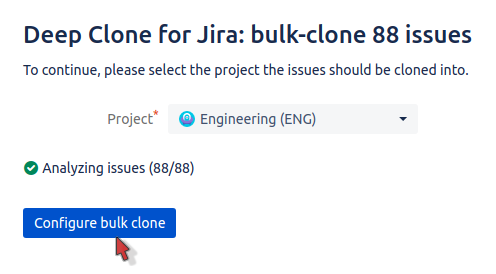 Search for “Deep Clone”, wait until the entry “Deep Clone for Jira” is shown and proceed to “Install” the app. After having installed the app from the Atlassian Marketplace, you can start using it right away! 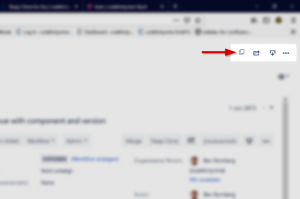 Just navigate to a Jira issue of your choice. Then, click on the “Deep Clone” button or the 3-dots-menu and the “Deep Clone” entry on the upper right-hand corner of the issue. You’ll see in parentheses next to these how many of an embedded type would be cloned, e.g. “Attachments (3)” would show that we’ve detected 3 attachments that would be cloned if the checkbox is activated. For comments and the work log, you can select that the original time the comment was created at will be added to the comment as the first line (since the comments themselves will be shown as being created when you clone the issue). You may close the dialogue at any time without the cloning process to be interrupted. Note however that if you start editing the issue right away, your changes may be overwritten until the cloning process is finished. Alternatively, you may also choose the “Clone immediately” button to skip the “create issue” screen and clone the issue immediately. However, if the app cannot extract all required fields from the original issue, the button will be greyed out and you’ll have to use the “Create and confirm” button. For commonly used clone actions, you may define presets which will reuse the previously defined clone settings. 3. Start a Bulk Clone by clicking the “Deep Clone: Bulk Clone” button on the top right next to the “share” and “export” menu. Note: On this screen there are two “Export” drop-down menus. One within the issue, the other one above on the right side of the search screen. You find the Bulk Clone option on the top right of the search screen. 4. Now, select the project to clone those issues into. A special case of Bulk Cloning is to clone an Epic issue including all of its issues. 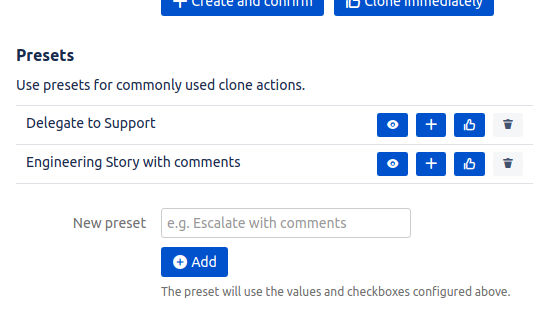 Since it’s such a common use case, we’ve implemented a dedicated “Epic Clone” feature. 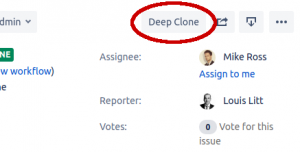 By default, all logged-in users can use Deep Clone for Jira. You can restrict permissions either globally or per project. A user has access by either having global permissions or project permissions, they don’t need both permissions. Note that Bulk Clone is not affected by permissions at this time, and all users always have access to Bulk Clone. Navigate to the “Global Permissions” within the Jira System settings. At the bottom, you will find the “Deep Clone for Jira” permission. 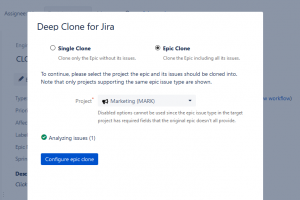 A user with this permission will be able to access Deep Clone for Jira for all issues in all projects, no matter how project permissions are configured. Navigate to the Permission scheme of a project. At the bottom, you will again find the “Deep Clone for Jira” permission. A user with this permission will be able to access Deep Clone for Jira for all issues within the projects using this permission scheme, no matter how global permissions are configured. Comments and work logs with restricted visibility will not be cloned. Comment mentions (e.g. writing “[~user]” in a comment) will still send email notifications (we try to suppress email notifications other than when the clone is created). Some ServiceDesk and other custom field types cannot be cloned. App data from “Zephyr for Jira Cloud” is not cloned, as the data is stored on the vendor’s servers and not within Jira. 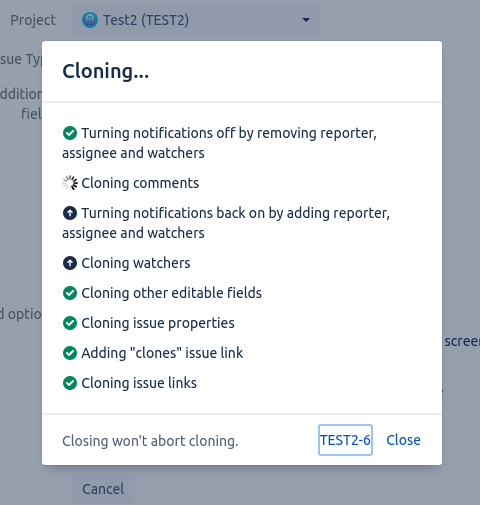 Thanks for using Deep Clone for Jira!